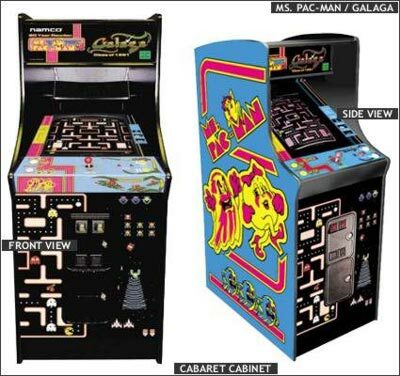 Ms. Pac-Man is back and she has brought Galaga along with her! In this two-in-one arcade game, you can play either of these legendary classics. New to this version is the ability to continue on Ms. Pac-Man. There are 1P and 2P Start buttons for both games. After the machine has been credited, you simply press the start button of the game you would like to play. Game Play: For Galaga, shoot the aliens, dodge their attacks and try to get perfects on the challenge stages for higher scores. Miscellaneous: The title of this game makes it seem as the two games are "meeting" each other after 20 years at a high school reunion. Indeed, an advertisement for this game feature faux yearbook clippings, naming Ms. Pac-Man "Most Popular" and "Most Likely to Succeed" and Galaga "Most Valuable Player" and "Class Space Case." This arcade game has two games in one machine. Additional game cartridges may be purchased and simply installed by you.